It feels as though the time has come to think about and plan for an IOTA field operating expedition. To date I have operated in two multi operator 2 day ARRL field day operations, 3 single day outings to Champlain lookout, and two 3 day winter operations, both of which were "off the grid" and 100% self supporting. 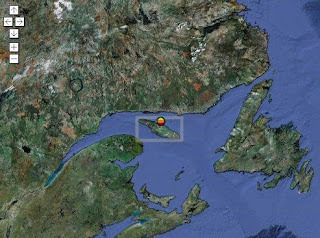 I have thought of either Summits On The Air (SOTA) or Islands On The Air (IOTA), for some reason I find the island expedition more interesting, perhaps its the water that attracts me as I tend to miss the salty air of the New Brunswick coasts of my childhood. The IOTA web site is the starting place for planning the options available. IOTA is an amateur radio activity programme designed to encourage contacts with island stations world-wide. The oceans' islands have been grouped into some 1200 "IOTA groups" with, for reasons of geography, varying numbers of "counters", i.e. qualifying islands, in each. The objective, for the island chaser, is to make radio contact with at least one counter in as many of these groups as possible and, for the DXpeditioner, to provide such island contacts. For both it is a fun pastime adding much enjoyment to on the air activity. 21 separate certificates are currently available for island chasers, graded in difficulty, as well as two prestigious awards for high achievement. a minimum distance from the mainland. must be either 1 kilometre in length or shown on a 1:1,000,000 scale map. Clearly there will be a minimal travel involved as I live in a land locked region of the country. Also, there are some real life constraints that will restrict my options. Bonaventure Island is at the eastern most tip of the Gaspe Peninsula. Bonaventure Island (Île Bonaventure), with Percé, was among the early seasonal fishing ports of New France, and was associated with the lineage of Nicolas Denys. The island became a migratory bird sanctuary in 1919 due to the 1916 Migratory Bird Convention between Canada and the United States. The Province of Quebec acquired ownership of the entire island in 1971 and later grouped it together with Percé Rock into the Parc national de l'île-Bonaventure-et-du-Rocher-Percé (Bonaventure Island and Percé Rock National Park) in 1985. One of the largest and most accessible bird sanctuaries in the world, with more than 280,000 birds, Bonaventure Island is a major tourist destination with boat and island tours from May to October. Boat and island tours are offered from May to October. The island features five hiking trails. Park wardens and naturalists also offer guided bird, fossil and geology walks and tours. The park's main interpretation centre is located on the mainland in Percé, in a restored building known as Le Chafaud. The exhibits focus on the park's bird colonies, marine life, ecosystem, geology and history. The official website for the Park is at the following link. Claimed by: 29.5% of participants. 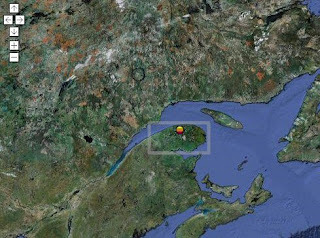 Anticosti Island (French, Île d'Anticosti) is an island at the outlet of the Saint Lawrence River into the Gulf of Saint Lawrence, in Quebec, Canada, between 49° and 50° N., and between 61° 40' and 64° 30' W. At 7,892.52 km2 (3,047.32 sq mi) in size, it is the 90th largest island in the world and 20th largest island in Canada. Anticosti Island is separated on the north from the Côte-Nord region of Quebec (the Labrador Peninsula) by the Jacques Cartier Strait and on the south from the Gaspé Peninsula by the Honguedo Strait. Anticosti Island is very large but very sparsely populated (281 people in 2006), mostly in the village of Port-Menier on the western tip of the island, consisting chiefly of the keepers of the numerous lighthouses erected by the Canadian government. 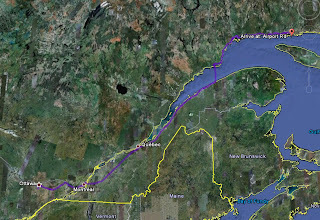 The entire island constitutes one municipality officially known as L'Île-d'Anticosti. From what I have read I have selected Anticosti Island as the destination, the avilability of cottages and poper places to stay on the Island make this a clear winner. Getting there is simple enough but will involve a long 20hr hrive and a ferry crossing. 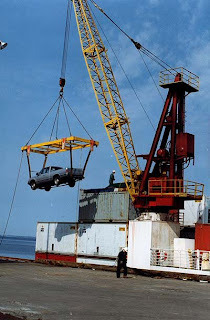 This is the only ferry crossing I could find to the island and is not a traditional ferry in so far as your vehicle goes with you goes like this. The passenger accommodations are much more traditional. I'm not sure I want to see the Pathfinder in the air like this I assume they will not drop it. It is 155km from Port-Menier to the Cabins at Vauréal, and the recommended driving times are at 60km/h which reflects the rugged nature of the roads on the island. 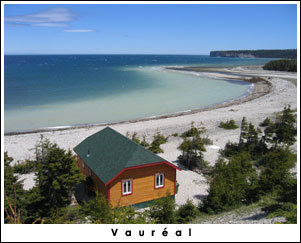 The typical cabin located at Vauréal which are on the north shore look very accomidating. These Cabins which are avilable in the park can be seen from this link on this page.